This miniature papercraft of Carl's house from the 2009 Disney Pixar movie Up is not your usual paper model. First, it is built with three different weights of cardboard and paper. Second, it is hand painted instead of making use of a computer printer for color. If you feel adventurous enough to attempt building one of these yourself, the creator of the house, Michal Miszta, has graciously provided a copy of his template here. 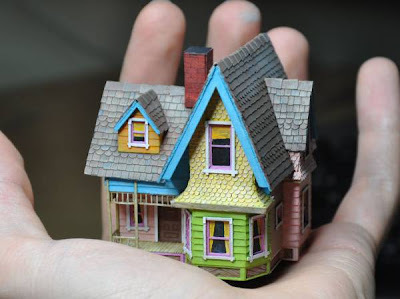 UPDATE 11/27/2011: The author of this papercraft no longer offers the template for the house, but additional photos of his build may be viewed here. UPDATE 11/8/2014: The template is available again! The link in the original post above has been updated! Link appears to be working now. Alas, the artist who created the house has removed it from his website. I am not sure if in the future if he will be putting it back or not. Sorry, the creator of the model does not provide detailed instructions. The best you can do is look at the finished photos and the "assembly notes" PNG included in the download and try to figure out where each piece goes.